Skinless and boneless no added antibiotic or hormone (federal regulations prohibit the use of added hormones in poultry) chicken breast with rib meat, non-gmo expeller pressed canola oil, water, brown rice crisp (whole grain rice, cane sugar, sea salt), whole grain yellow corn flour, potato flakes, seasoning [sugar, maltodextrin, torula yeast, salt, modified food starch, tomato powder, paprika, natural flavor (autolyzed yeast extract, thiamine hydrochloride, corn syrup solids), citric acid, smoke flavoring, less than 2% silicon dioxide as anti-caking agent], corn starch, cane sugar, sea salt, baking powder, garlic powder. Gluten free. 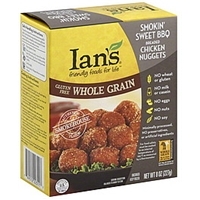 Brand/Manufacturer: Ian's Ian's Natural Foods, Inc.
Chicken nuggets (skinless boneless no added antibiotics and hormone [federal regulations prohibits the use of added hormones in poultry] chicken breast with rib meat, canola oil, cornflake crumbs (milled corn, evaporated cane juice, sea salt, caramel color [natural color derived from corn]) water, all natural potato flakes, sea salt). Coated and battered with cornflake crumbs (milled corn, evaporated cane juice, sea salt, caramel color [natural color derived from corn]) water, yellow corn flour, corn starch, sea salt, baking powder, granulated garlic). Cooked in canola oil. Gluten free. Chicken breast with rib meat, water, native rice starch, salt. 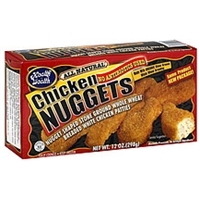 Breaded with: dried potatoes, rice flour, salt, spices, dried garlic, dried onion, maltodextrin, and natural flavor. Battered with: water, corn starch, yellow corn flour, rice flour, and xanthan gum. Predusted with: corn starch, rice flour, and spice. Breading set in expeller pressed canola oil. Gluten free. 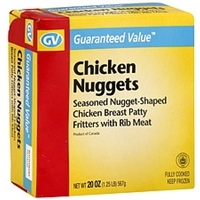 Chicken (chicken never administered antibiotics or animal by-products, vegetarian grain-fed diet. ), water. 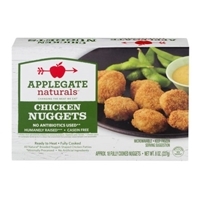 Contains less than 2% of the following: corn starch, salt, natural flavor (oregano). Breaded with: wheat flour, sugar, yeast, expeller pressed canola oil, salt. Battered with: water, wheat flour, corn starch, yellow corn flour, salt. Breading set in vegetable oil.contains: wheat. Fried chicken patties (ground chicken, water, enriched flour (wheat flour niacin, reduced iron, thiamine mononitrate, riboflavin, folic acid), partially hydrogenated soybean oil salt, isolated oat product soy protein concentrate, sodium phosphate, dextrose, monosodium glutamate , dextrose, paprika, spice extract), french fries (potatoes, partially hydrogenated vegetable oil (canola oil and/or soybean oils) salt, dextrose, sodium acid pyrophosphate added to preserve color) corn, brownie (sugar, water, wheat flour, vegetable oil, cocoa eggs, margarine (partially hydrogenated soybean and/or soybean oils, water mono and diglycerides, beta carotene for color, may also contains vitamin a palmitate, salt, whey, soy lecithin, natural flavor} acacia and xanthan gums, baking soda, salt, natural and artificial vanilla flavor (water, propylene glycol, ethanol, caramel color]), water, contains 2% or less of sugar, margarine (partially hydrogenated soybean and/or soybean oils, water, mono and diglycerides, beta carotene for color, may also contain vitamin a palmitate, salt, whey, soy lecithin natural flavor) salt, partially hydrogenated soybean oil.contains: wheat, milk, soy, eggs. 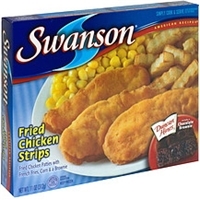 Chicken, water, corn syrup, contains 2% or less of: natural flavors, salt, dextrose, isolated soy product, isolated soy protein, autolyzed yeast extract, sodium erythorbate, sodium nitrite, turkey broth. Made with beef collagen casing.contains soy. 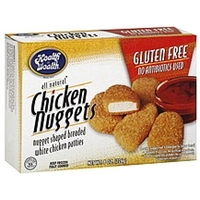 Boneless chicken breast with rib meat, water, unbleached wheat flour, contains less than 2% of salt, sugar, yeast extract, sea salt, dehydrated garlic, onion powder, garlic powder, white pepper, spices, yeast, natural extractives of celery seed. 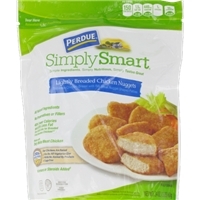 Chicken breast meat, water, chicken skins, soy protein concentrate, modified food starch, salt, and sodium phosphate. Predust and battered with: wheat flour and water, breaded with: bleached enriched wheat flour (wheat flour, niacin, reduced iron, thiamine mononitrate, riboflavin, folic acid), spices, yellow corn flour, salt, leavening (sodium aluminum phosphate, sodium bicarbonate), dried whey, yellow corn meal breading set in vegetable oil.contains: wheat, soy and milk products. 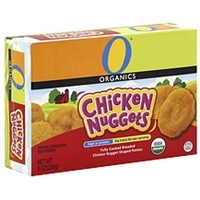 Organic boneless, skinless no added antibiotic and hormone (federal regulations prohibits the use of added hormones in poultry), chicken breast with rib meat, canola oil, organic panko breadcrumbs (organic wheat flour, organic cane sugar, organic expeller pressed palm oil, yeast, salt), dry potato, sea salt. 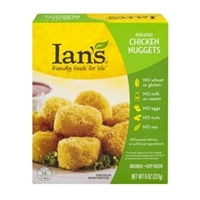 Breaded with organic wheat flour, water, corn starch, yellow corn flour, canola oil, organic cane sugar, yeast and sea salt. Cooked in canola oil.contains wheat. Boneless white chicken meat, water, soy protein isolate, salt, dextrose, onion powder, garlic powder, spice extractives, flavor (maltodextrin, lemon juice solids). 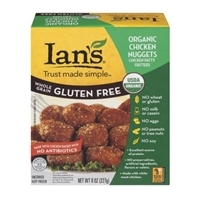 Breaded with: breadcrumbs (enriched bleached wheat flour (niacin, reduced iron, thiamine mononitrate, riboflavin, folic acid), leavening (sodium acid pyrophosphate, sodium bicarbonate), vegetable oil shortening (soybean), dextrose, salt, durum wheat flour, yeast, dough conditioners (ascorbic acid, l-cysteine monohydrochloride), flavoring), water, yellow corn flour, corn starch, enriched wheat flour (niacin, reduced iron, thiamine mononitrate, riboflavin, folic acid), salt, soy, protein isolate (with soy lecithin), guar gum, dextrose. 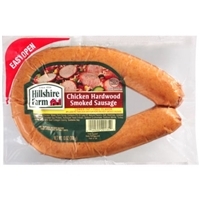 Fully cooked in vegetable oil (canola).do not defrost. 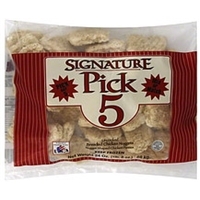 Contains: soy, wheat (gluten). 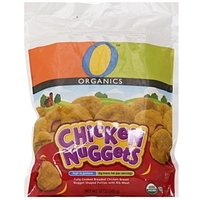 Brand/Manufacturer: o organics chicken nuggets Lucerne Foods, Inc.
Organic chicken, water, organic rice starch, sea salt, natural flavor breaded with organic wheat flour, organic cane juice crystals, sea salt, yeast, organic yellow corn flour, organic annatto and organic paprika battered with: water, organic wheat flour, organic corn starch, organic yellow corn flour, sea salt, leavening (sodium bicarbonate, sodium acid pyrophosphate), breading is set in organic expeller pressed soybean oil.contains: wheat, soy. Chicken breast, water, natural flavoring, (flavorings (tapioca starch, salt, gum arabic, natural flavor, lactic acid and sunflower oil). Evaporated cane juice, soybean oil, plant fiber), sea salt. 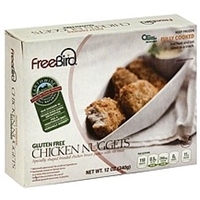 Breaded with: organic unbleached stone ground whole wheat flour, yeast, sea salt, barley malt extract. Battered with: water, yellow corn flour, corn starch, sea salt, spices, expeller pressed canola oil. Browned in expeller pressed canola oil.contains wheat. 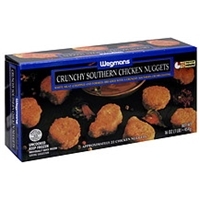 Brand/Manufacturer: wegmans chicken nuggets Wegmans Food Markets, Inc.
Chicken breast with rib meat, water, salt, sodium phosphate, breaded and battered with: enriched bleached wheat flour (with malted barley flour, niacin, reduced iron, thiamin mononitrate, riboflavin, folic acid), enriched wheat flour (niacin, iron, thiamin mononitrate, riboflavin, folic acid), enriched yellow corn flour (yellow corn flour, niacin, reduced iron, thiamin mononitrate, riboflavin, folic acid), modified food starch, water, salt, spice, partially hydrogenated soybean and/or cottonseed oil, leavening (sodium bicarbonate, sodium aluminum phosphate, sodium acid pyrophosphate), autolyzed yeast extract, torula yeast and butter flavor (maltodextrin, salt, dehydrated butter, butter flavor), dextrose, mono-glycerides, fumaric acid, less than 2% silicon dioxide to prevent caking. Breading is prebrowned in soybean oil. Antibiotic free chicken breast with rib meat, water, seasoning (flavorings [tapioca starch, salt, gum arabic, natural flavor, lactic acid, sunflower oil], evaporated cane syrup), sea salt, breaded and battered with: rice flour, corn flake (corn meal, salt), corn starch, salt, spices and spice extractives including extractive of paprika and extractive of turmeric, garlic powder, onion powder, ground celery, browned in expeller pressed canola oil. Gluten free. Organic chicken breast with rib meat, water, modified corn starch, natural flavor (oregano), organic wheat flour, organic cane juice, cornstarch, sea salt, yeast, organic yellow corn flour, organic annatto and organic paprika, battered with: water, organic wheat flour, organic corn starch, organic yellow corn flour, sea salt, leavening (sodium bicarbonate, sodium acid pyrophosphate), breading is set in organic expeller pressed vegetable oil.contains: wheat, soy.